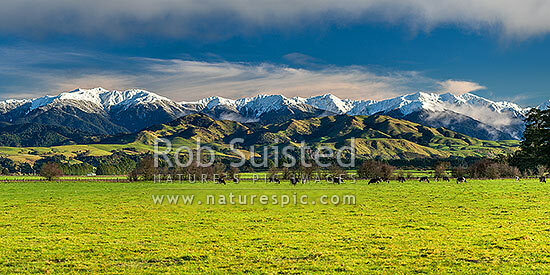 Snowy Tararua Ranges above grazing dairy cattle on lush Wairarapa farmland near Masterton. Mt Holdsworth (1470m) left, Three Kings centre, Mitre (1571m) at right. Panorama, Waingawa, Carterton District, Wellington Region, New Zealand (NZ), stock photo.